Once upon a time, on Manhattan’s Upper West Side, there was at the corner of Amsterdam and 109th Street a restaurant called ‘The Green Tree’. Its large and faithful clientele came mostly from nearby Columbia University and from among the neighborhood’s residents–many of them elderly West Siders with traces of Old World accents in their conversation. The Green Tree served a very satisfactory selection of traditional Hungarian dishes. There were, for example veal strips braised in wine and paprika, or chicken sauced with mushrooms and sour cream, either of these served with little dumplings or fried potatoes and onion. Eggs scrambled together with calves’ brains were always available as well as old standbys like stuffed cabbage and bécsi szelet (aka Wiener Schnitzel). To end a meal there were pancakes with apricot, sweetened cheese or chocolate filling, or, if you preferred, strudel– poppy seed, cheese or apple. One could also order a 3-course Menu, and Cold Sour Cherry Soup was often one of the First Course options. Thus we arrive at the point of this bit of restaurant nostalgia. 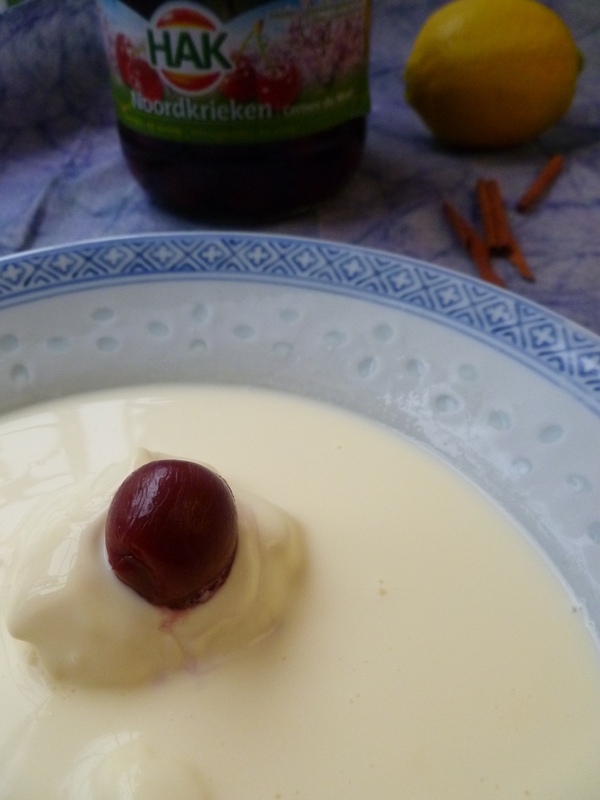 The Green Tree, true to its Hungarian origin, offered its fruit soup at the beginning of a meal. 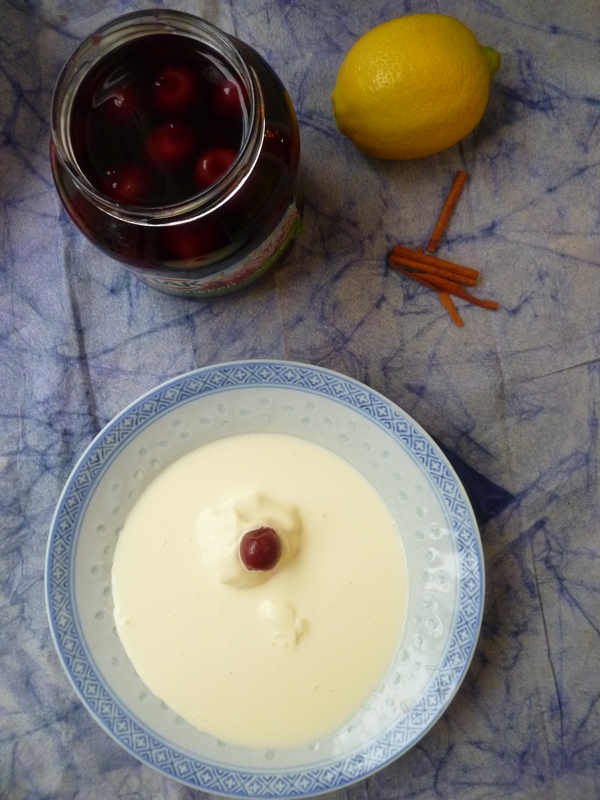 While there are fruit soups which may become dessert, a Hungarian cold fruit soup isn’t one of them. In the context of Hungarian cuisine, to serve such a soup at the end of a meal would be as confusing as offering a bowl of gazpacho for dessert. Timing Note: The soup is best if made a day ahead so that it has time to chill well. Ingredients: Amounts are given first in metric measures. In parentheses are the closest American equivalents. 700-850 grams of Bottled Sour Cherries in Syrup (about 4 cups generously measured in a large liquid measuring cup): Sour cherries bottled in glass jars tend to be of a better quality than canned ones and are preferable for making soup. 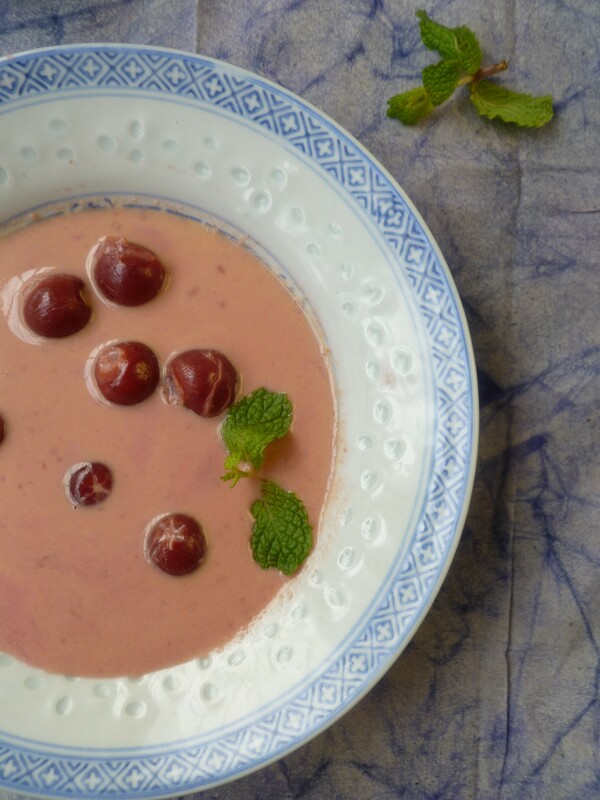 The photographed soup was made using a 700g (net weight) glass jar of cherries that are already lightly sweetened, plus part of a second jar, for a total of 850 grams of drained cherries. 3. 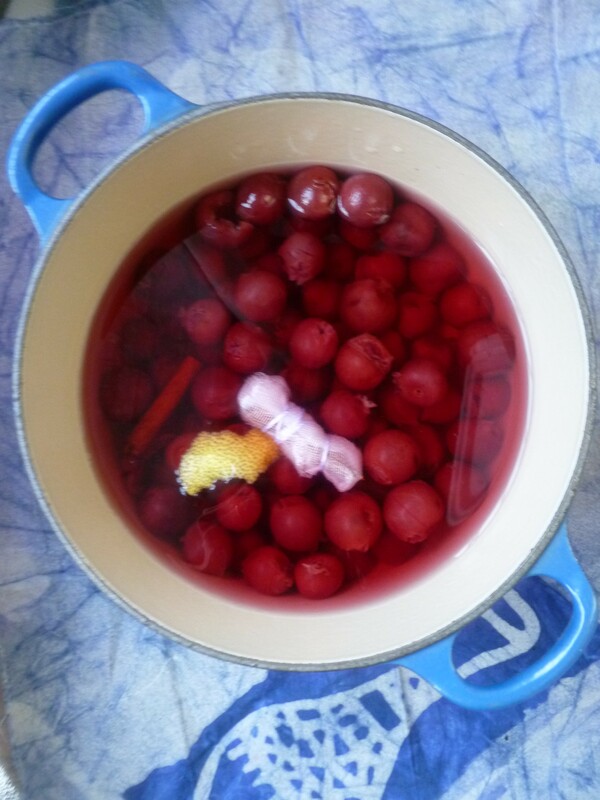 Bring the cherries to a simmer over medium heat. As soon as they begin to simmer, adjust the heat to keep them at a simmer and cook for 5 minutes. 4. Remove the pot from the burner and let the cherries steep for 15 minutes. 5. With a slotted spoon, remove enough cherries to measure 200 grams (or about 3/4 cup measured into a liquid measuring cup). Purée them in a food processor or blender and return them to the soup pot. Use a little of the liquid in the pot to rinse the last bit of cherry purée off the sides of the processor or blender and pour it into the pot. 6. Stir in the heavy cream. Taste and add a little of the reserved cherry juice to accent the cherry flavour. (2 Tablespoons of reserved juice were added to the soup in the photos. The amount is a matter of personal taste. Use additional reserved juice to sweeten the soup more if you like. 7. Cover the soup and chill it well in the refrigerator. 8. Remove the lemon peel and cinnamon sticks before serving. 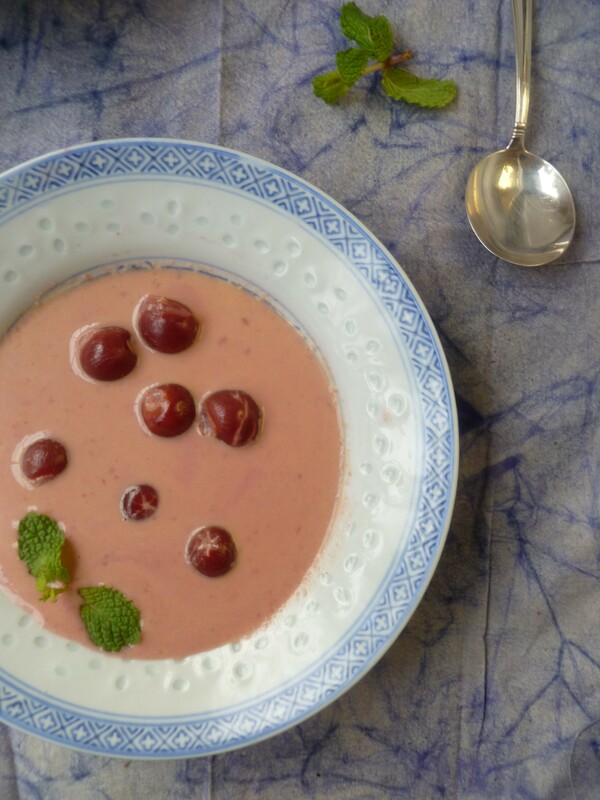 Using a slotted spoon, divide the cherries as evenly as possible among the soup bowls. Ladle some of the liquid part of the soup into each bowl and garnish with a bit of fresh mint if it’s being used. 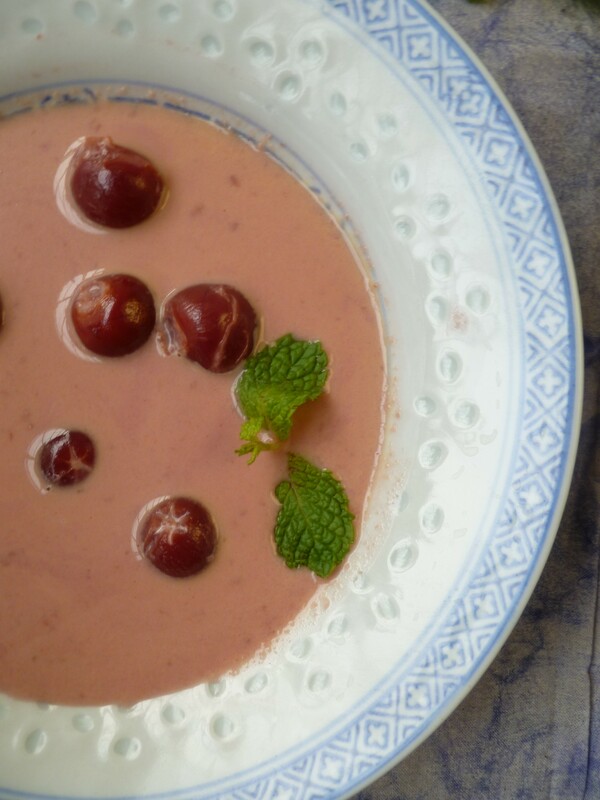 An Acknowledgement: Cold Sour Cherry Soup is a traditional Hungarian favorite. Recipes for it abound. This version of it has been provided by Dorka Lakos. Dorka lives in Budapest. She is an exceptional language instructor and her book, Hungarian for foreigners ~ Magyar nyelv külföldieknek by Lakos Dorottya (2001), is an excellent introduction to Hungarian for anyone wishing to learn the language. Dorka also happens to be a good cook. The diplomatickitchen is fortunate to have her as a source for fine versions of traditional Hungarian dishes. 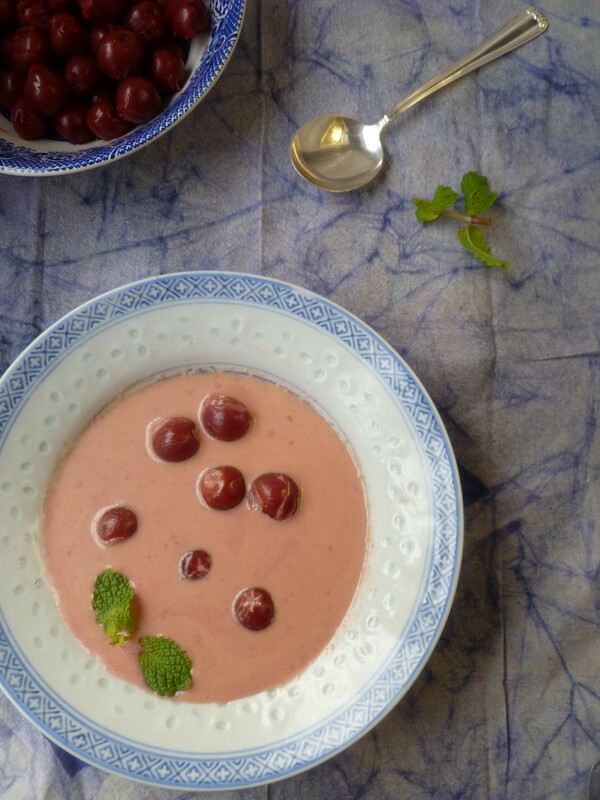 A Note: Dorka’s Cold Sour Cherry Soup ~ Dorka Hideg Meggylevese is the First Course in the Dinner Menu: Magyar Accents ~ a Dinner for Four.